I have to share with you the most adorable new website, Bea + Sea Boutique. Bea+Sea Boutique offers affordable women's clothing where women feel comfortable and confident in what they're wearing while not having to spend a fortune. I just love love this adorable olive green dress right? 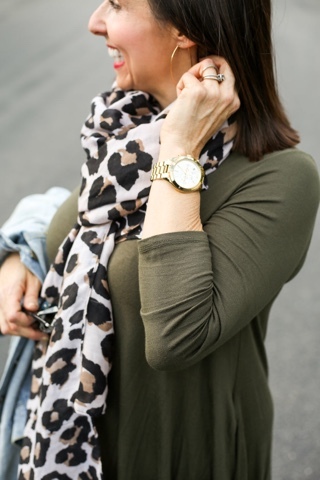 I paired it with this fun leopard print scarf, a great denim jacket, my fun tennies, some great Miranda Frye jewelry and my Dior sunnies. This look is perfect for a casual outing. I can wear this all day running errands, picking up the kids from school and taking them to all of their after school activities. I love wearing a look like this that can take me from morning to evening and looking cute all day long. I hope you check out Bea+Sea Boutique. I can't wait to hear what you think!!!! Thanks to @Photobyvincent for pictures and Happy Reading!! You can shop the look by clicking on the links above!! !